PURPOSE Freshly blended, our six-bottle Protein Bundle is designed to fuel your muscles while keeping you well hydrated throughout the day. Our signature blends are made with a combination of nut milk, spices, and a delicate addition of fruits and vegetables. It is recommended as a pre- or post-workout supplement in addition to your meals, or simply whenever you're on-the-go! 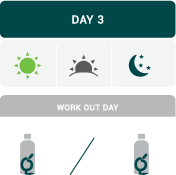 ACTION With this program, you will enjoy 2 bottles a day over 3 days, for a total of 6 bottles. Each bottle is labeled so that you can consume the right nut milk at the right time (numbers 1 through 6). 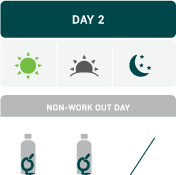 Each bottle can be consumed as a meal, or a snack, or as a pre- or post-workout supplement. Make sure your juicing days are balanced with unprocessed food, lean protein, legumes, vegetables, and fruits.